Moving author name above post title in Genesis HTML5 themes only two lines to be added on functions.Php file. Here is how to get author name above post title. We usually have absolutely no support for Paid Themes. This article is published on request from a regular after failure for few times. Apart from the coding, we have explained why moving author name above post title is important. So far, Genesis is concerned, there are two important Plugins – Genesis Simple Hooks and Genesis Simple Edits. You can use these Plugins to modify the appearance in easy way, however, moving author name above post title in Genesis HTML5 themes will require the below mentioned steps. We have not tested on non-HTML5 old themes, on non-HTML5, they should work too. There is no need to flush the cache while you are logged in, the changes will show up immediately. If you are new, first take a backup (i.e. copy that file to your computer) before doing any experiment. This Article Has Been Shared 8250 Times! List all URLs of published posts and pages in WordPress in a convenient way – this URLs are the public URLs and intended for SEO, Promotion with AdWords etc. 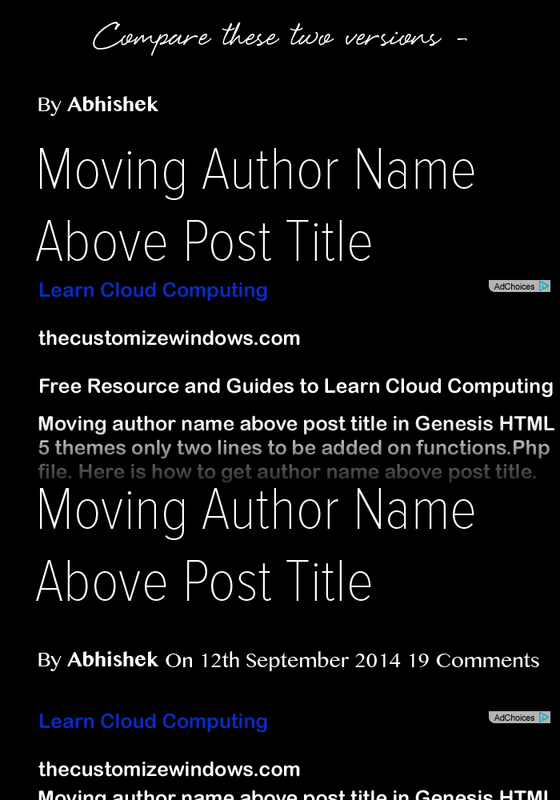 Cite this article as: Abhishek Ghosh, "Moving Author Name Above Post Title in Genesis," in The Customize Windows, December 15, 2013, April 26, 2019, https://thecustomizewindows.com/2013/12/moving-author-name-above-post-title-in-genesis/.